Lessons from the dark side of over-investing in marketing ROI efforts and ignoring the creative aspects of marketing. John Swigart, the CMO of online auto insurance provider Esurance, recalls their early startup years. It was 1999. His marketing team instantly felt like the proverbial “kid in a candy store.” They hired a stellar web design team, received a hefty advertising budget, arrived early to market with one of the first interactive websites. They aspired to redefine the insurance industry. Yet, after two years of building innovative demand generation and marketing analytics programs, Esurance’s brand earned the “price check and cartoon company” moniker. Prospects used Esurance’s website to compare prices, then buy from competitors. Much to their chagrin, Esurance’s well-calibrated online strategy generated the wrong brand impact. Even worse: the market had seized control of their brand. Swigart realized that if they did not react quickly, they would waste millions on advertising and witness stagnant growth. Their experiences illustrate the dark side of over-investing in marketing ROI efforts and ignoring the creative aspects of marketing. The C-suite expects you to be an expert in marketing analytics — even though the market is changing at warp speed. I recently counted over 100 community building, blogging, social intelligence, and social marketing management platforms on Eloqua’s recent infographic (attach below). 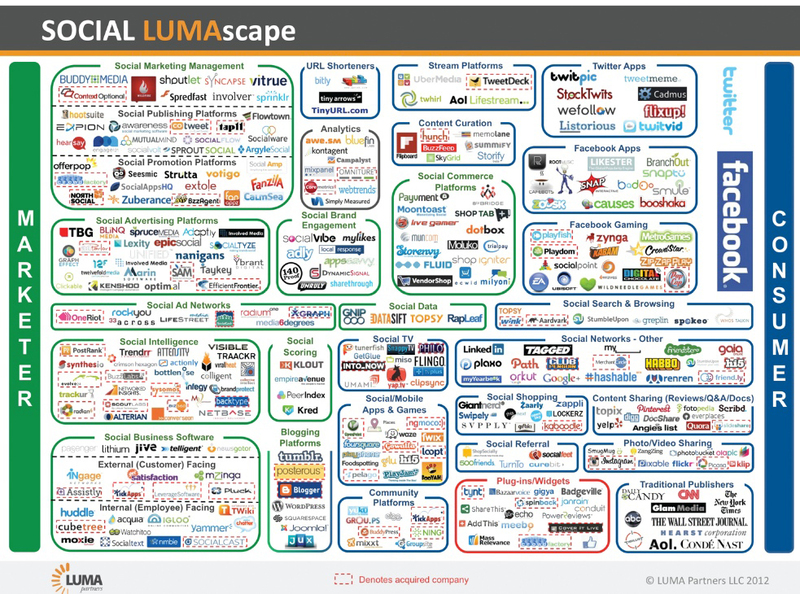 How can a CMO sift through this hornet’s nest of options without external help? attend my private events now carry a sales quota. Stingy, short sighted executive teams often cut back on professional development and marketing funds when they are needed the most. Marketing can neither anticipate nor seize new opportunities due to intense focus on fulfilling urgent needs. The CMO of a $25M nonprofit recently told me that her Board of Directors demanded a “significant return on investment” from a new veterans jobs program within 120 days, even though the most successful programs in other regions demonstrated a return within 24 months. CMOs need time to creatively respond to strategic shifts, competitive tsunamis, and innovative technologies. Without time to reflect, my clients simply cannot act. They feel paralyzed and choose the worst option: status quo. During my CMO breakfast discussion last month, I learned that most organizations are jumping on the marketing analytics bandwagon, often forcing CMOs to ignore their importance as chief storytellers. Fournaise Marketing Group recently surveyed 1,200 CEOs and found that 75% of them expect their marketing group to be purely ROI focused. While 90 per cent of these CEOs place high trust in their CIO and CFO,a shocking 74% said that marketing cannot clearly define business value. Fournaise’s study reflects a “point in time” assessment of how CEOs feel. Unfortunately, it does not give us a glimpse into their willingness to reduce investments in, or suspend, their brand initiatives while marketing gains traction in the analytics domain. In light of today’s intense competition among B2B companies and our buyer’s ability to rapidly turn off the noise of excessive marketing “white noise,” I believe that storytelling and engaging customers have become the truly urgent marketing imperative. If marketing organizations were described using dog metaphors, we could gain more insight into the benefits of finding a healthy balance between the analytic and creative aspects of marketing. 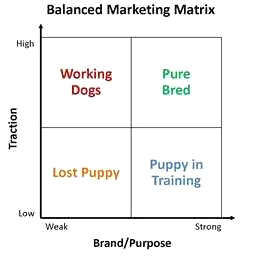 The majority of CMOs in my recent discussion group landed squarely in either the “Puppy in Training” or “Working Dogs” quadrant. Puppies in Training enjoy lots of attention (strong brand repute), but are not yet potty trained (poor or inconsistent execution and no meaningful analytics). Working Dogs do their jobs well, but are often a best kept secret. Since their brand repute has been downplayed, they are under-appreciated and under-valued, leaving tired or injured canines in their wake. After spending a few years as Working Dogs, Esurance leapt into the Pure Bred quadrant. CMO John Swigart began tracking how he allocated his management time, and began investing at least 60 per cent in branding and positioning efforts. He and his team also invested in a significant brand makeover. Within months, Esurance abandoned their high volume, price sensitive customer profile and focused on attracting tech-savvy buyers in a higher income bracket.. According to Swigart, “as a result of our increased branding focus, we enjoyed a very strong 2nd quarter in 2012 with 14% insurance premium growth over the prior year quarter, and a 30% upswing in new business sales.” While they cannot attribute all of their success to the re branding focus, he said their profitable growth would not have been possible without it. Some CMOs are thriving by developing a healthy balance between their marketing ROI efforts and their brand story. In my next post, I will highlight other organizations who have also found that balance. Those are the prized pooches worth following.